Starting in spring, Concord’s Birch Street Community Garden hums with activity as gardeners of all ages tend more than a hundred plots of ﬂower and vegetable gardens. It’s just more evidence that community gardening has taken root in the Capitol region. 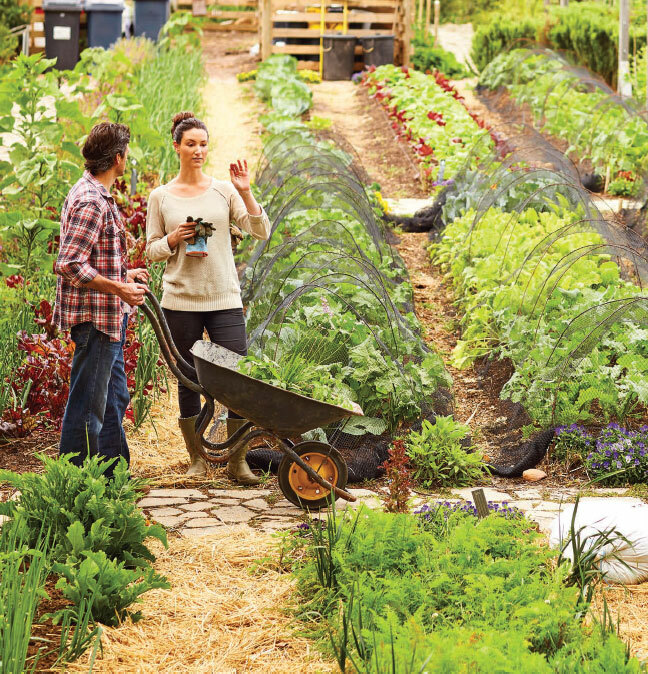 Community gardens combine a chance for socialization and recreation with an opportunity to grow fresh food, as well as inspire self-reliance and community development. Our national resurgence of interest in local foods and agriculture has sparked greater appreciation for gardening of all sorts. According to the University of New Hampshire’s Cooperative Extension, there are at least 100 community gardens around the state. Here are ﬁve of them in and around Concord that offer something different for anyone with a yearning to garden. The Birch Street Community Garden is located off a dirt road on a site formerly owned by the New Hampshire State Hospital. According to Bob Spoerl, garden organizer and land agent for the New Hampshire Division of Forests and Lands, patients used to use part of the land to garden and spend time outdoors. Now, about 150 gardeners of all ages tend the gardens and grow everything from corn, tomatoes, and squash to pumpkins and sunﬂowers. Still under development, the garden is located on a half-acre lot in the center of the city, at the corner of Spruce and Massabesic Streets. This spring, community members and volunteers will plant the garden for the ﬁrst time. Residents of Families in Transitions’ family shelter will also pitch in. Long-term plans include a community center with a learning center and teaching kitchen as well as an area to sit and enjoy the green space. Operated by the town’s agricultural commission, the Boscawen Community Garden is located at the intersection of Corn Hill Road and Woodbury Lane. The garden was started to supplement offerings from the local food pantry and provide opportunities for residents to grow their own food. The plots are a bargain: a 12-by-12-foot space is $15. There’s also access to a shared herb garden. On sunny days, you will hear the hum of several languages in the Sycamore Community Garden, which is tucked in a grassy ﬁ eld at NHTI in Concord. Women in colorful dresses tend to their individual garden plots while children play hide-and-seek among the 10-foot-tall African corn stalks. Sycamore offers recently arrived immigrants and refugees familiarity in a new place. Gardeners hail from 10 different countries, including Nepal, Bhutan, Iraq, Burundi, Nigeria, and Somalia. “It’s truly what makes them feel at home,” says longtime community garden volunteer and former garden manager Cheryl Bourassa. The organic garden, with 186 plots, connects new Americans to their homelands and gives them an opportunity to help feed their families by growing familiar fruits and vegetables. Designed to serve low-income families, the garden is also accessible via the local bus line, an important consideration for aspiring gardeners who don’t have reliable transportation. Crops include African grinding corn, okra, cucumbers, tomatoes, peppers, hot peppers, potatoes, kale, daikon radishes, African eggplants, beans of all kinds, and more. Now in its eleventh season, the one-acre garden operated by the New Hampshire Food Bank grew more than 13,000 pounds of vegetables last year to supplement the organization’s efforts to feed New Hampshire residents in need. Servicing 430 agencies and food pantries around the state, the Food Bank’s production garden is one way the organization addresses food insecurity. During the growing season, volunteers from a variety of service organizations and the corporate community prep, weed, water, compost, and tend more than 130 different-sized beds.